After the Squirrel Cage Jail, we had a bit of a drive ahead of us to get into the heart of corn-country, but luckily had a roadside attraction to visit along the way. 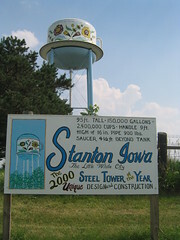 Stanton, Iowa is the home of two notable water towers. One fashioned to resemble a coffee pot and one to resemble a coffee cup with saucer. With colorful Scandinavian design, the coffee paraphernalia rise majestically above the town. The coffee pot tower was the first design and is located in the corner of a large cemetery. Kristy and I had to tiptoe over the graves of the Stantonites to get good shots. It holds 40,000 gallons. The coffee cup/saucer is a short distance away and holds a whopping 150,000 gallons. Why the coffee theme? Stanton is the home of an actress, Virginia Christine, who played Folgers' Mrs. Olson on TV commercials. 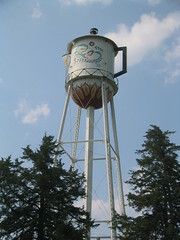 During the rest of our travels through Iowa, we realized that the water towers were not just a fluke, but every po-dunk town in Iowa proudly announces their existence with a water tower labeled with the town name. You will always know where you are in Iowa due to their water tower system.